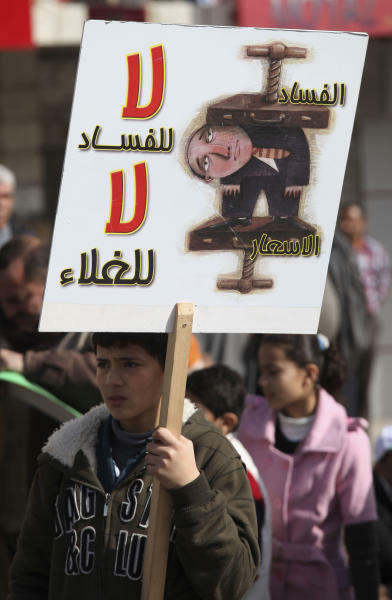 AMMAN, Jordan (AP) — Hundreds of Jordanian Islamists, youth activists and other opposition groups rallied Friday in Amman, calling for a boycott of next week's parliament elections. The demonstration came just five days before the vote, which will for the first time see a prime minister emerge from among the winning candidates rather than by appointment by the king. King Abdullah II has said the elections crown two years of reforms he initiated to stave off massive Arab Spring-type of protests that have already toppled four long-time rulers in the region. Friday's peaceful demonstration drew about 1,300 Muslim Brotherhood members and others united in the boycott campaign and in demands that the king cede some of his powers and give parliament more say in the country. Holding up small yellow cards mimicking a judge's warning to players in soccer games, the protesters chanted: "Freedom, freedom. This is not a royal gift, but our right." The protesters say Abdullah's reforms do not go far enough. In particular, a new election law adopted last year is a bone of contention for the Brotherhood, Jordan's largest opposition group, and the youth activists. They say the law continues to ensure that the majority of parliamentary seats go to Bedouin loyalists of the king at the expense of the Brotherhood, other opposition groups and Jordanians of Palestinian origin. "We want changes made to the constitution to ensure that it's the people who have the power," said one of the demonstrators at Friday's rally, Mahmoud Awad. An English teacher from the southern town of Tafila and a member of the largely secular "Hirak" youth group that is strong in rural areas, Awad said his country "needs a true parliamentary government that is representative of the people." Dima Taboub, a member of the Islamic Action Front, the Brotherhood's political arm, said Abdullah's reforms have been "cosmetic, just to appease some people." "Instead, we see our economic conditions deteriorating," said Taboub, wearing the white headscarf of conservative Muslim women in Jordan. "Votes are being sold and bought. We don't feel this election will be genuine." An Independent Elections Commission created last year has vowed that candidates caught in vote buying would be prosecuted. But local newspapers report that some candidates have offered to buy votes while some citizens have offered to sell their votes to the highest bidder. Resource-barren Jordan has struggled to keep economically afloat. Facing an acute financial crisis, it has been forced it to seek a $2 billion standby loan from the International Monetary Fund. Employment is running high, officially about 13 percent, but in reality closer to 17 percent. It has also long been reliant on aid from Western and Gulf Arab donors. Last November, violent nationwide protests erupted after subsidies were removed from gasoline, heating and cooking fuel, setting off a spike in prices. Prime Minister Abdullah Ensour said the moves were necessary to save the economy from further deterioration, but the price hikes drew many ordinary Jordanians to the streets to vent their anger. The Jan. 23 elections will not be the first time that the Brotherhood and its followers shunned parliamentary elections, though a few Brotherhood supporters have broken the boycott call and are running as independents. The government says nearly 3 million Jordanians have registered to vote in the elections. The turnout for Friday's rally was smaller compared to other opposition demonstrations, even though Brotherhood leader Zaki Bani Irsheid claimed earlier this week that the strength of the boycott campaign would be seen in the streets. Still, the boycott will be a blow to Abdullah's efforts to showcase his reform agenda. "I don't see any change," said 18-year-old protester Hassan Sarhan, from the northern town of Mafraq. "This would have been my first time to vote. But I won't because it just seems like the same old game."